Power systems are going through a paradigm change from the current power systems dominated by electric machines to the next generation smart grid enabled by power electronics, presenting a great opportunity to the power electronics society. 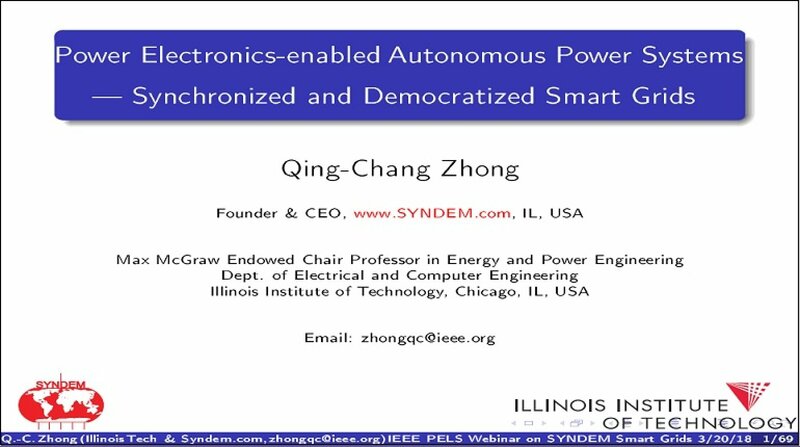 In this lecture, it will be shown that the power electronic converters in millions of active, intermittent, non synchronous, variable and distributed energy resources and flexible loads can be controlled to behave like virtual synchronous machines (VSM). They can all take part in the regulation of power system frequency and voltage via independent individual actions in a synchronized and democratized manner, leading to synchronized and democratized smart grids. Moreover, the dedicated synchronisation units, often phase locked loops, can be removed to further reduce complexity and improve performance. These active distributed players only require local information and communicate with each other through the power network, rather than through additional communication infrastructure, bringing stability, scalability, operability, reliability, security and resiliency to next generation smart grids. Click www.syndem.com for more details.